If you count from 1 to 100, how many 5s will you pass on the way? Sewage is to pipeline as _____ is to wire. Which word best expresses the meaning of: "interpretive"? If you were running a race and passed the person in second place, what place would you be in? Foot is to knee as _____ is to elbow. Which word best expresses the opposite meaning of "timid"? Not bad. Most people can’t get more than 4/10 correctly. Give it another try, and SHARE your score with everyone you know. You got 9/10. Your IQ is 143-149 (near genius). You have an introspective personality. You analyze experiences, you look at situations from multiple perspectives, and you’re naturally empathetic. You’re quick to notice changes in moods and attitudes even when people don’t say anything about it, and you’re always there to offer comfort and support. That’s freaking awesome! Carry on, and SHARE your phenomenal score with everyone you know. You got 10/10. 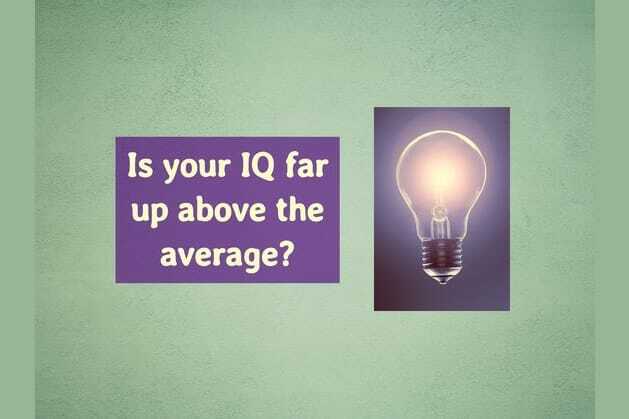 Your IQ is 149 or higher (genius or near genius). Like most geniuses, you enjoy your own company and often get lost in your own thoughts. You don’t set regular sleeping hours. You stay up late and reflect about things. You think and feel more deeply than others, and are emotional in your relationships. You are definitely a dog person, and you drink at least 3 cups of coffee a day. Let us know in the comments if we're spot-on, and share your PERFECT score with the world. Try to get at least 7/10 correctly.